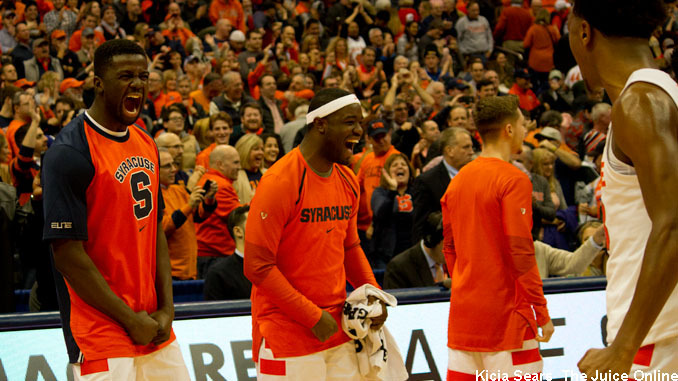 Dec 8, 2018; Syracuse, NY, USA; Syracuse guard Adrian Autry (center) celebrates during the second half of the Orange's 72-71 win over Georgetown at the Carrier Dome. Mandatory Photo Credit: Kicia Sears, The Juice Online. If Syracuse can maintain anything close to the level of three-point shooting they have done in their last three games, it could make things very interesting in March. Thursday night, the Orange (14-5, 5-1 ACC) splashed 14 three-pointers, making it their third straight game shooting over 44 percent from long range with at least 11 made threes, blowing out Miami in the second half of a 73-53 win at the Carrier Dome. SU rolled up a 25-7 run in the second half, ripping apart a tight game. The Hurricanes (9-9, 1-5) were within three points five minutes into the second half, but were helpless to stop Syracuse, who needed less then ten minutes to put the ‘Canes away. Elijah Hughes tied career highs of six three-pointers and 22 points in the win. Hughes’ offensive outburst was the lead story on a night when Syracuse shot 50 percent from the floor and 46.7 percent from behind the arc, adding 7-of-8 free throws for good measure. The Orange also had 22 assists on 26 field goals. That sizzling shooting complemented a strong defensive effort, as Miami made just a shade under 34 percent from the field, including 27.6 percent on threes. While SU had 11 blocked shots in the game, they were hammered on the glass, as the Hurricanes had a 39-27 rebounding advantage, including 15 offensive boards. Miami had the best of the opening minutes, leading by a half dozen points on two occasions, the latter coming when they grabbed a 17-11 advantage just over eight minutes into the contest. Syracuse broke a scoreless streak that lasted over four minutes by outscoring the Hurricanes, 20-7, over a six-and-a-half minute span. Oshae Brissett started the streak with a three-point play, then Frank Howard hit his third triple in the first 12 minutes of the night. His long bomb from straightaway knotted the score. Following a Miami trey, Buddy Boeheim connected on a three-pointer from the left corner to tie the game once more. After a basket from the ‘Canes, the Orange ripped the lead away by scoring 11 of the game’s next 13 points. Boeheim hit a three from right of center. After Miami responded with a deuce, Tyus Battle set up a swished triple from the left wing by Elijah Hughes. Boeheim stepped into his third three, then a Hughes lay-up was goaltended, making it eight straight points for a 31-24 SU lead with just under two minutes on the clock. Miami got a triple and a lay-up in the remaining time, more than offsetting a Boeheim foul shot, to trim the Syracuse lead to 32-29 at half. The ‘Canes added a lay-up in the opening minute of the second half to draw within a single point. Miami would hang around for the next six minutes until the Orange dropped the hammer on them. Battle started the SU roll by driving the left side of the key for a three-point play, then tossed a fast break lob for a Dolezaj lay-in. Battle then added two free throws after the Miami bench was assessed a technical foul. The charity shots gave Syracuse their first double-digit lead of the night at 52-41 with 11:33 left on the clock. Hughes hit a three followed by Marek Dolezaj doing the same. Hughes had a massive blocked shot to stop a Miami dunk, then got some space with a jab step for another three to stretch the margin to 17 points. The Orange kept their foot on the gas, eventually finishing the 25-7 burst with six straight points for a 69-48 lead with under five minutes to play. A pair of Brissett fouls shots would push the gap to 23 points, but a late Miami triple made the final score 73-53. In addition to tying his career-high offensive outburst, Elijah Hughes had three blocks and three steals. Buddy Boeheim hit three triples en route to 12 points and Tyus Battle had ten points and nine assists. Frank Howard also had three treys for his nine points. Paschal Chukwu blocked five shots in the game. Dejan Vasiljevic was the lone Miami player to reach double figures, finishing with 11 points. Zach Johnson chipped in with nine points while Ebuka Izundu, Anthony Lawrence, and Chris Lykes each added eight. SU will get very little rest before returning to action, as they travel to #10 Virginia Tech for a Saturday night game. The Hokies (15-3, 5-2) will undoubtedly show up in a foul mood, as they were hammered Monday night at North Carolina, 103-82. That was the second road loss to a ranked foe in Virginia Tech’s last three games. Four different Hokies average at least 13 points per game, paced by Nickeil Alexander-Walker’s 18.3 points per game. Alexander-Walker is one of four different VT players who have made at least 27 threes already this season and the team collectively has hit over 42 percent of their attempts from beyond the arc. SU knocked off Virginia Tech at home last season, 68-56. Oshae Brissett paced Syracuse with 19 points while Tyus Battle and Frank Howard each added 17. Alexander-Walker hit four threes as he had 19 points to lead Tech. ESPN will televise the contest between the Orange and the Hokies, which will start at 8:00pm Eastern. The telecast will also be available online at ESPN3.com and through the ESPN app.